What do Sesame Street, a British Stockbroker, and Refugees have in Common? In honor of Refugee Awareness Month, I want to discuss two innovative responses to the refugee crisis: one from 80 years ago and the other being carried out today. Both examples serve as an important reminder that when it comes to serving young refugees, determination, innovation, and creativity are key. Passport for Eva Rosenbaum, a child who fled to Great Britain on the Kindertransport. Courtesy of United States Holocaust Memorial Museum. On an impulse in December 1938, the 29-year old British stockbroker Nicholas Winton canceled a skiing vacation in the Alps and flew to Prague to meet with a friend aiding refugees in the Sudetenland. The western region of Czechoslovakia had just been annexed by Nazi Germany and the Jews caught in the newly minted German territory were desperate to escape. While Great Britain had set up the Refugee Children’s Movement in response to the November Pogrom (or as it commonly called the Night of Broken Glass) in 1938 to help get some Jewish children out of Germany and Austria before war broke out, no such program existed in Czechoslovakia. Lacking a mass-rescue effort, Winton took a leave of absence from his job in England to start one. Relying on his wit, he managed to save 669 children from deportation and death. 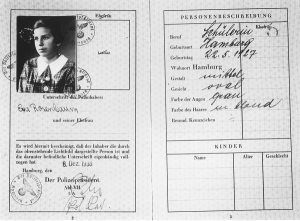 His work involved fostering secret contacts with the Gestapo (German Secret Police), securing nine railroad trains, endless paperwork, forgery, bribes, and even a romantic encounter with what he later discovered was a Nazi spy. After the war, Winton never talked about what he had done. It was not until his wife was cleaning the attic in 1988 and discovered a scrapbook he had kept from that time that the story was finally brought to light. 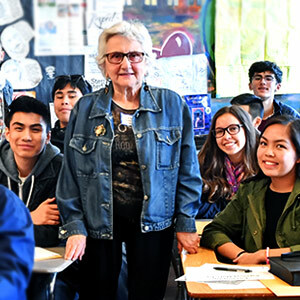 Holocaust educators, myself included, share the story of the Kindertransport (German: Children’s Transport) with students to illuminate the experiences of young Jewish refugees fleeing the Nazi onslaught and to discuss a creative solution to a seemingly impossible problem. Following the November Pogrom in 1938 until the start of World War Two in 1939, nearly 10,000 Polish, Austrian, German, and Czechoslovakian children waved goodbye to their parents as they boarded trains, planes, and boats for Great Britain. The Kindertransport was a unique lifeline for Jewish children, even more so when we consider that of the 6 million Jews murdered during the Holocaust, an estimated 1.5 million were children. Sesame Street’s Grover with children in Jordan. Photo courtesy of International Rescue Committee. Over half of the 65 million people around the world displaced by conflict, environmental disasters, and genocide are children. When this statistic is combined with the fact that the average refugee spends twelve years in a refugee camp, we can better appreciate the challenges that spending one’s youth fleeing conflict poses for a child’s development. Despite the volume of children in refugee camps, more pressing needs including medical care, food, housing, and safety supersede their access to education. To help put this in perspective, the International Rescue Committee (IRC) reports that just two percent of total humanitarian aid is allocated to education during crises. Without access to school, displaced children loose more than their homes; their very future is in jeopardy. To combat poor access to education, the IRC has partnered with Sesame Street to bring education to children fleeing mass atrocities like those happening today in Syria, millions of whom who have landed in refugee camps throughout the Middle East. More than 5.6 million Syrians have fled the country as refugees, half of whom are children. Armed with a $100 million award from the MacArthur Foundation, the IRC and Sesame Street are bringing hope and education to kids, and in so doing, securing a future for refugee children. 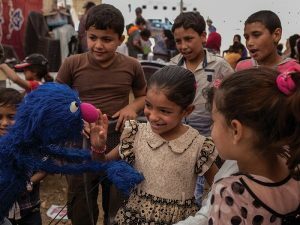 Their initiative to bring educational materials and yes, Elmo and other fuzzy Sesame Street celebrities, into refugee camps highlights the need for creative solutions to some of the world’s most pressing problems. The beautiful reward of supporting refugee children is rooted in the long-term benefits of such work. For example, Winton may have saved 669 children from 1938-1939, but those children have gone on to have descendants that now exceed 6,000. And while providing food and medicine to refugees serves the immediate needs of those in refugee camps, education can help provide for young people well into the future. The reality is children are often overlooked when it comes to helping victims during genocide; however, incredible potential exists to help them. As we think about how to help children fleeing from conflict, disaster, and genocide in the future, a commitment to creative solutions is essential. Mark Jonathan Harris and Deborah Oppenheimer. Into the Arms of Strangers: Stories of the Kindertransport. Bloomsburg Publishing, 2001. Patrick Kingsley. The New Odyssey: The Story of the Twenty-First-Century Refugee Crisis. The Guardian, 2017.